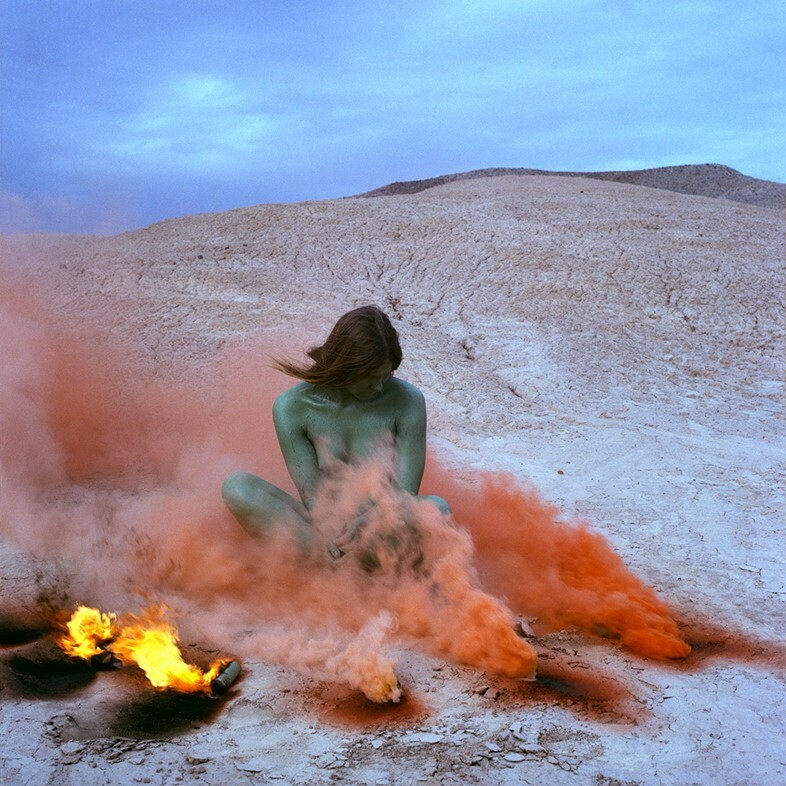 Fifty years ago, Judy Chicago set the world aflame, unleashing Atmospheres into the air we breathe and igniting a passion for pyrotechnics that continues to this very day. Yesterday, Miami gallery Nina Johnson opened an exhibition of never-before-seen photo prints documenting this prescient series of landscape installations and performances made staged between 1968–1974, concurrent to Chicago’s major survey, A Reckoning at The Institute of Contemporary Art. “It is not unusual for it to take decades for people to understand my work,” Chicago explains. It is not at all surprising, considering the ways in which Atmospheres bridges the divides between the timeless and the temporal by making art an action, rather than an object, to behold – as the ultimate expression of the sacred feminine principles of Mother Earth. Atmospheres first found expression on the streets of Pasadena, California, where Chicago lived and worked, several years after graduating with an MFA from UCLA. “Using a colour system I had developed for emotive purposes, I did a series of dimensional domes, in which the colour was trapped inside the transparent shapes,” Chicago recalls. 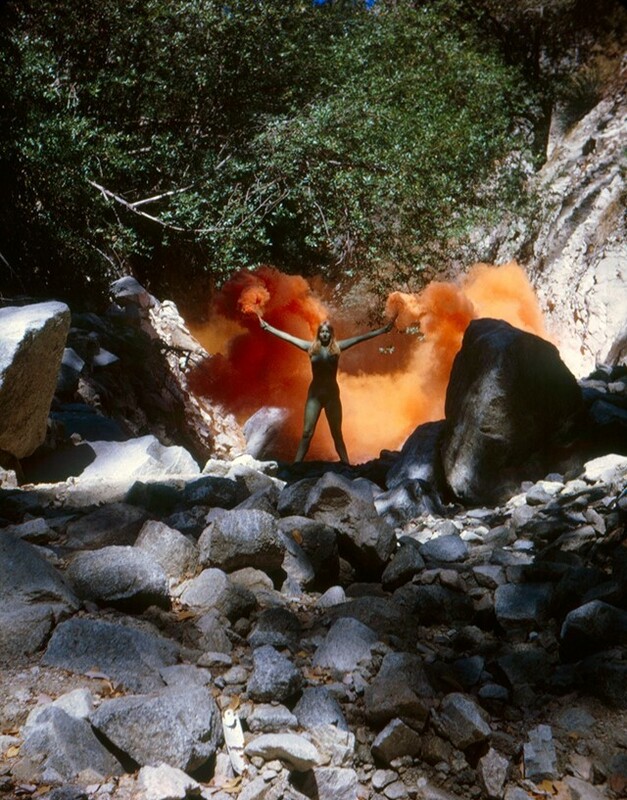 At a time, Land Art was a radical movement against the commercialisation of art, yet at the same time, the men who led it seemed inclined to destroy the environment, much like their colonising forefathers. Or, even more horrifically, combine the two – as Richard Serra did in 1970, when he cut down Redwood trees and piled them into the Pasadena Art Museum. Chicago rejected it all, recognising the divinity of the Earth and our necessity to protect it from ourselves. 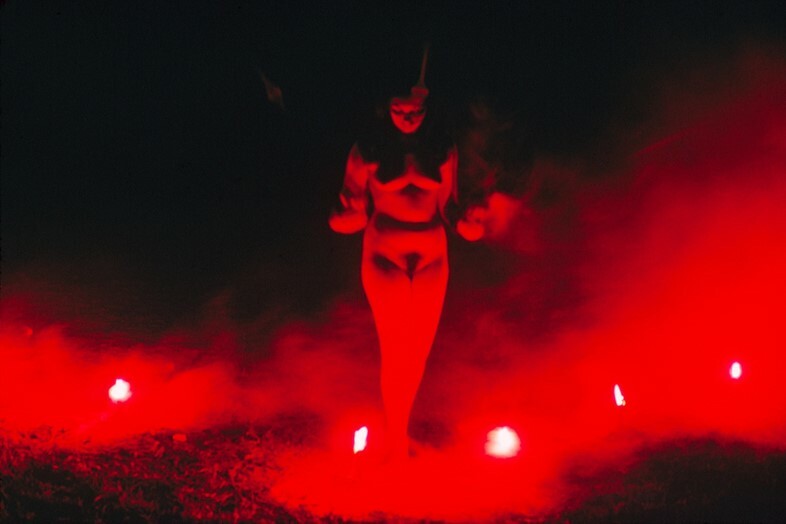 “I spent a considerable amount of time working on images of the feminine as sacred, drawing on scholarship that had demonstrated that all early societies were goddess worshipping,” she says. Acting as steward, a shaman, and scribe by uniting earth, air, and fire, Chicago reveals the ineffable grandeur of the sacred and the profane by connecting us to the moment as it unfolds. 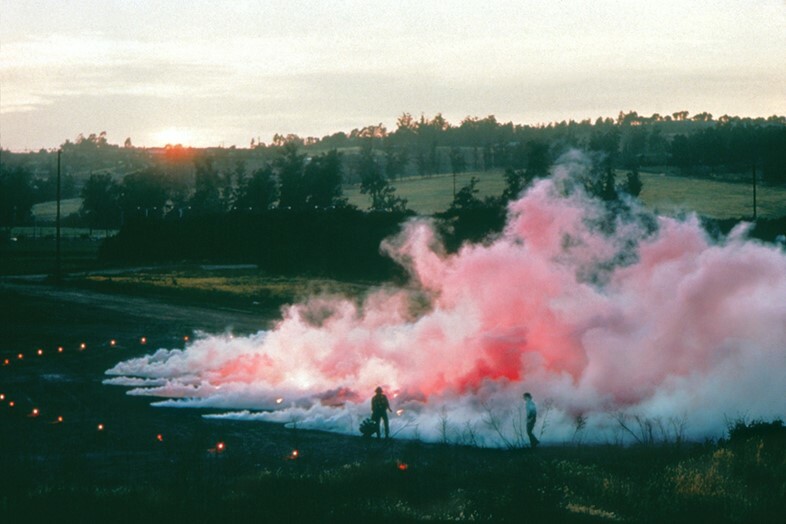 As the works in Atmospheres progressed, they became increasingly complex, powerful, and profound – staging events in urban spaces like malls, colleges, and museums, as well as in deserts, forests, and beaches when no one else was around. Chicago’s first event held in a built environment was done when she placed red, orange, and yellow smoke on a shelf in front of the Santa Barbara Museum. “It looked like the museum was on fire. I really loved that because I was having trouble with art institutions and curators who were not ready to recognise my work,” Chicago reveals. Indeed, the return of Atmospheres is a reminder of the challenges women artists face, not only to create the work but to remain physically and psychologically safe. “I stopped working with fireworks as a result of a lack of support coupled with intense sexual harassment,” Chicago says in reference to the treatment she received from the owner of the fireworks company where she apprenticed. But, as Atmospheres reminds us: dreams do not die. They may simply exist in a state of suspended animation awaiting the moment when the forces are aligned for our return. In 2012 The Getty commissioned Chicago to create Sublime Environment, a new fireworks piece. More recently, she staged Butterfly for Brooklyn in Prospect Park, and speaks of filling the Grand Canyon with coloured smokes. “It is really intriguing that there is suddenly so much interest in my fireworks pieces, both past and present,” Chicago observes. Intriguing, but not surprising in the least, for Chicago has often been treated as a prophet in her own land. The return of Atmospheres heralds what we can only hope is a greater return: protecting the sanctity of the Earth, lest we have to answer for what we have wrought.